welcomed me with rain, in the past it was always sunny and heat waves as well, but this time i had plenty of tropical rain, even the temperatures were wrong. yes, it was mostly cold. i could not see my mum and friend in any direction i was looking, so i rang them with a borrowed mobile, and mum said that they are coming to meet me, they just arrived... my flight was on time, but they were late, thanks to some roadwork. so in a moment we were happily greeting each other and then we began our happy and chatty journey to the little village without shops, where my mum, dad etc. live. yes, more family members are living there and two big dogs. we stopped over in kaufland/shopping center in marjanske lazne not far from our destinations. i bought a few 3kg nets of oranges and a water melon. they had only two and it was also a bit expensive, the next day i went there with my parents and there was no sight of watermelons, so i was pleased with myself that i got one the day before, even when mum was pressuring me that i do not need any fruit, because she got for me what i ordered - strawberries, peaches, apples and bananas were waiting for me at their place, and that we would go shopping the next day anyway. no, she did not change my mind, because when i feel something i must follow it, i have known this for a long time now, otherwise i have regrets, which i've been avoiding for ages. oh, how happy i was, that i had a beautiful and big water melon, because i really craved one so much, no wonder, i was dehydrated a lot, after a long flight in artificial air. but i did not open my watermelon, it was late afternoon, and i open my watermelons only in the mornings, i do not use the fridge, i like to eat fruit at room temperature. so i have to finish the whole melon in one day or i can have the rest next day for my first meal of the day. so i had sweet and juicy strawberries and they even tasted like strawberries, i was glad they were grown in the czech republic, not that i have problems eating fruit from different regions, but i like to support local business (czech). and i had yummy peaches before i went to sleep. i opened the watermelon the next day, after we returned from shopping, because i do not have breakfast soon after waking, sometimes after long time (4pm), and it was very yummy watermelon full of sun, sweet with strong watermelon aroma and very juicy. the first night i went to sleep as usual around midnight and in the morning around 8 i was on my way with my parents for fruit shopping. i got a lot of czech strawberries, and i do not know from where lychee, louquats, bananas and a few pears. yeah, i was never very keen on pears, but lately i want them and i love them. they burst with sweetness and juice. i always peal them, the skin never tastes good enough. i was relaxing and also there was a lot of chatting, and i even managed to visit a friend only a few houses away..
and the next day the same friend who came to pick me up at the airport, took me and my mum in to skalna, the village where i grew up, for her birthday lunch at an old castle. i took with me sweet strawberries, they all knew me, so they did not react. i also got lost, and i took some photos, but mostly i was daydreaming. the day after, my bother arrived, the next day he left. he returned with his daughter and grandchild on the third day. they left on the fifth day. also, on the fifth day, me and mum paid for a holiday in turkey. we flew to enjoy the sun, sea, fruit and full on relax on the seventh day. 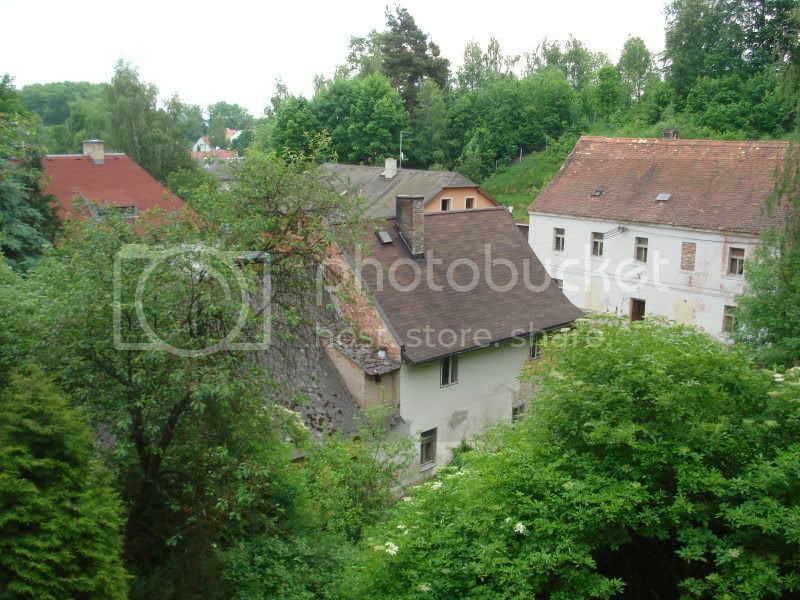 view from the castle yard in skalna, one of the many places i used to play a lot.